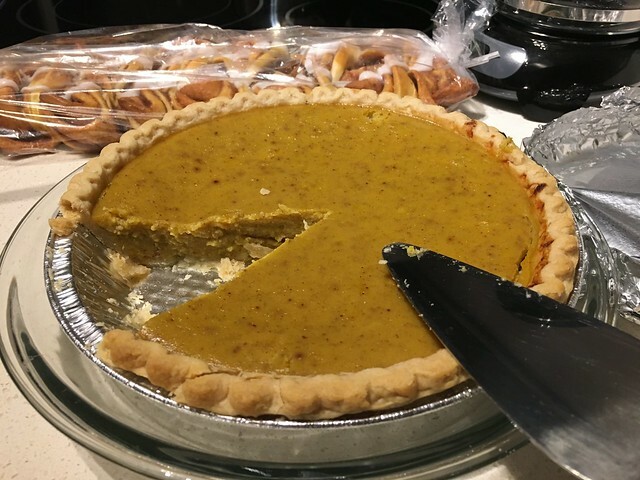 I made pumpkin pie for the first time this Thanksgiving with my mother-in-law using the Bittman recipe. She then sent me her preferred recipe. This is what I did to make a version with eggnog. 2 cups eggnog. The Bittman recipe’s 4 cups was way too much and even the 3 and 1/3 seemed too much. This is probably because the pumpkin is not strained. The result was very fluffy. I fear it may have slightly curdled, but it was still very tasty. The Bittman recipe calls for only baking (at a lower temperature) for less than 50 minutes. There was still not enough spice. I’m not sure the eggnog added much objectively, but it’s emotionally satisfying.